Well, I was having technical difficulties with inserting images into a post, so instead I created a slide show on the Journal page. Enjoy. Tomorrow we are, once again, going to St. Louis. I’m procrastinating by choosing to blog instead of packing. And, would probably be easier to pack because at this very moment, Drew is sitting himself on the pull out drawer that typically holds a desktop computer keyboard in between my arms as I type this message. To complicate it even more, he’s leaning forward and placing his nose upon my knuckles. Not sure where he gets this ideas, but I’m in-between laughter and annoyance. 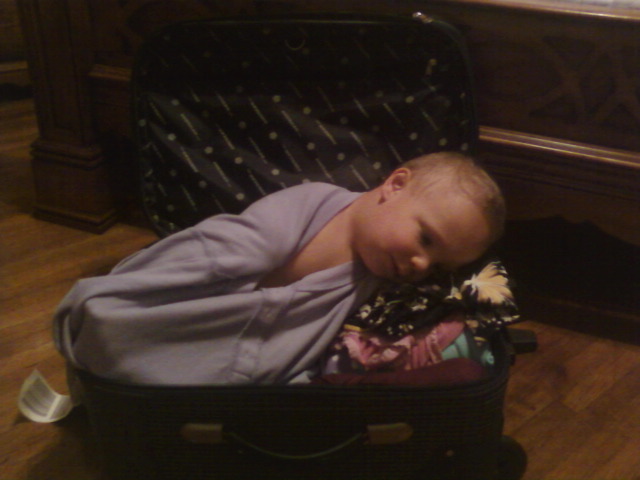 UPDATE: After completing this blog, I began packing and can’t resist updating this blog with a picture of Drew. He's pretending to sleep here, wrapped up in my shirt, and simulating a snore sound. The plan for this trip is to visit the St. Louis City Museum which also houses the World Aquarium. Monday morning, we are visiting physical and occupational therapists at Shriners and then a doctor on Tuesday. Luckily, our hotel booked through Priceline ($76/night was my winning bid for this $139+/night hotel!!) has a pool so if we aren’t at the hospital, the museum, or aquarium, we’ll be in the pool. Maybe the hotel will have a hot tub too so after Drew goes to bed, I can sneak a dip! Previous Post Road Trip, Road Trip, Road Trip…..